You shouldn't need telling, but I just feel like reminding everyone: caramel hot chocolate is very tasty. And surprisingly filling. I went into Hanley today, and had one at an over-priced well-known coffee drink place. Also in Hanley: I looked at stationery, and ate at an over-priced well-known sandwich food place. But most importantly, I went with my beautiful wife Lauren. Because yes, I've been married for nearly three years and am still incredibly soppy. The most entertaining website I've come across in the last few days is fake science, with answers to questions such as "How do helicopters fly?" 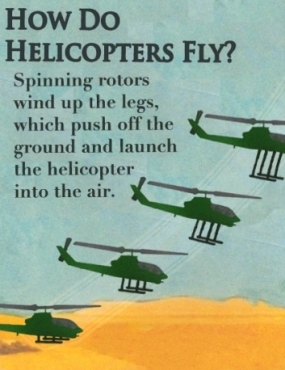 (Answer: "Spinning rotors wind up the legs, which push off the ground and launch the helicopter into the air.") Just the kind of answers I'll be able to pass on to my son (once he's born and starts asking questions). Fake science is on tumblr, and I'm also trying it out: I'm nickoli, (not much of a surprise with that name). Tumblr claims to be the easiest way to blog, so let's see if I actually use it.